Scotch and Green Tea was originally a way to make the whisky taste better for new Scotch drinkers, but it turns out to be a very refreshing drink. — Pour the Scotch and green tea over the rocks. Stir in sugar if you’re doing it that way. Better than most water. I was not shocked to hear that many Chinese were mixing Scotch whisky with green tea in bars and clubs. Like a Louis Vuitton handbag, Scotch is an icon of affluence and a satisfying reward for hard work. But it’s not an easy taste to acquire. Green tea is also an acquired taste. It’s very grassy, which is why it’s less popular than black tea, but I do enjoy the aroma of hot green tea steeping in the kitchen when family comes to visit. The last question, before testing this combination, is what kind of Scotch? I’d heard it was Chivas Regal, which due to strong marketing is the leading brand of aged, blended Scotch in Asia. So I asked Mark Gillespie, the founder of whiskycast.com, who verified that it is indeed Chivas Regal in China, but Johnnie Walker in Taiwan, with Ballantine’s (from Chivas Brothers) being a value-priced alternative. 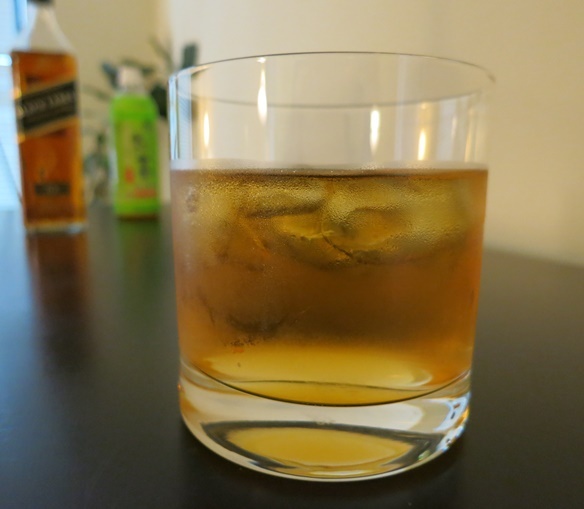 I decided to take it a step further, and try 4 different Scotches: Chivas Regal, Johnnie Walker Black, Highland Park 12-Year-Old, and just for fun, my resident Scotch, Laphroaig Cask Strength. Chivas Regal is fruit and nuts, smooth with very light smoke or peat. It’s sweet and slightly malty with a smooth, warm finish. Excellent blended whisky for first-time Scotch drinkers. Johnnie Walker Black is sweet, malty, creamy, vanilla, spicy, with hints of peat and cooked fruit. It has a mellow, silky, sweet, and slightly spicy finish. It’s so well blended you can find new flavors each time you try it. Highland Park 12 is smooth, malty, and caramel-flavor, with sea salt, medium smoke and peat. The finish is long and smooth. This is a beautiful introduction to single malt Scotch. Laphroaig Cask-Strength is smoke and peat and sweetness and fruit and medicine. It finishes with a dry lingering spice. It’s single-malt Scotch at full thrust. 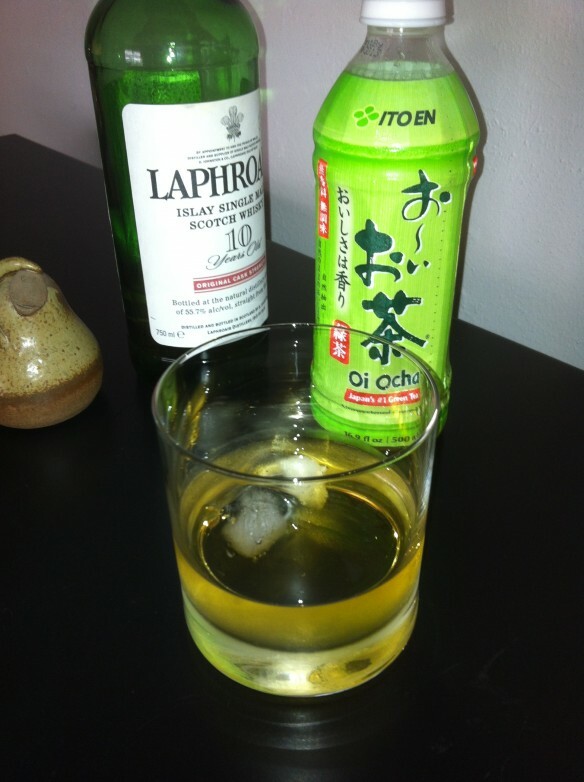 First, I mixed 1 part Chivas with 1 part Ito En Japanese Green Tea from the bottle, on the rocks. The drink had little Scotch taste, with a slight burn, but it was immediately clear that Scotch and Green Tea does indeed mix well. Next, I tried the same mix with Highland Park. The flavors of this Scotch and the tea were cancelled out by each other. With the Johnnie Walker, I tried several different mixes. 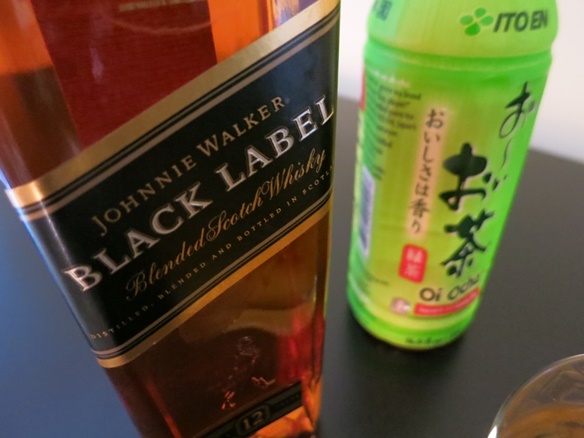 1 part Johnnie with 1 part green tea was good, you could taste both Scotch and tea, but neither strongly. With 2 parts green tea, the taste was washed out, and with 3 parts of tea the taste of Scotch was just about gone. However, the drink was exceptionally refreshing, something to enjoy for hours of sipping. Further, at 1 part Johnnie to 4 parts green tea, the drink became like water. The tastes had completely nullified each other, and it was a cocktail that even a Scotch-hater might enjoy. It’s clear that Scotch & Green Tea was originally a way to enjoy Scotch, without actually having to taste it too much. However, it turns out to be a very good cocktail, and a superb way to ease into Scotch-drinking.